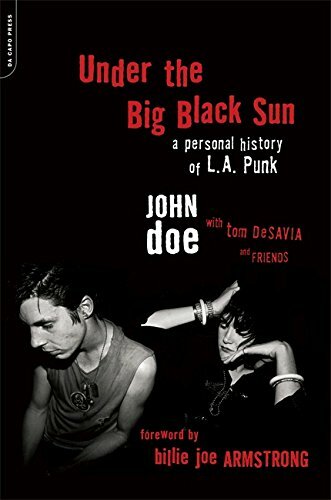 I recently finished reading the book John Doe, bassist and lead singer for X, wrote/compiled with co-author Tom DeSavia about the L.A. Punk scene. It’s a collection of essays by punk band X members Doe, Exene Cervenka, and many other figures in that scene – writers, club owners, and band members from the Go Go’s, Black Flag, Fear, The Minutemen, The Blasters, etc. – and in aggregate basically chronicles the scene from its earliest days to its end. There are some great stories and it’s a decent read overall. I did learn some things, and this one remains with me. I knew that Exene’s sister Mirielle (immortalized in the X song Riding with Mary) died in a car accident. But I learned that Exene was notified in between sets the band was playing, and X decided to play the following set as a tribute. Even more astonishing was that Mirielle was great friends with Steve Nieve (keyboardist for Elvis Costello and the Attractions) and his wife Kay who were in the front seat of the VW Bug they were driving to the X show with Miriella in the back seat when the car was broad sided, breaking bones in Steve and Kay, and killing Miriella instantly. Damn. Still makes me sad. Been using this read as an opportunity to digitize my entire X vinyl collection, and the other albums I have from bands in that genre/period, so I’m steeped in the music lately – Suicidal Tendencies, The Plugz, Los Lobos, Rank and File, The Motels, and more. This reminded how political a lot of these band’s writing was, especially X, with everyone railing against the obscenities of that era (Regan, etc.). Relevant to current times. The Resistance goes on. This entry was posted in Musings and tagged Music, Musings, Reads.